Critics Ask If Photos Of 'Beautiful' Africa Are An Effective Response To Trump's Alleged Slur : Goats and Soda The online backlash to the president's alleged insult was a wave of photos highlighting the positive side of places he mentioned. Now there is a backlash to the backlash. 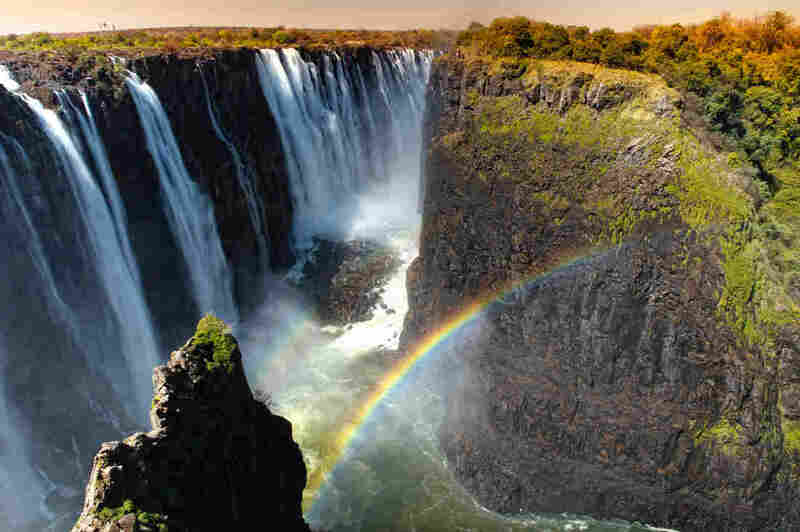 Victoria Falls sits on the border between Zambia and Zimbabwe. Photos of beautiful scenes from Africa and Haiti have been flooding the Internet in response to President Trump's reported slur. But before long, backlash to the backlash began to surface. In a widely shared opinion piece for Al-Jazeera, South African writer Sisonke Msimang called the alleged comment "racist" and "tacky" ... but truthful at the core. "Poor people do not leave their countries because of wanderlust: They leave because life feels pretty 's***ty,' " she wrote. "This — it seems — is a more important reality to address than whether a discredited man who is a known provocateur has hurt some feelings." 9. <10% female literacy in some states. Sure, people in even the poorest places display enviable joy and determination, but she says the pretty landscapes and long lists of accomplishments gloss over terrible daily realities faced by those who have been left out of development success stories. "The 'Africa as paradise' social media posts are a sort of creative non-fiction then," she wrote. "Of course, the Cape Town skyline is beautiful, but we also know that life in Crossroads or Nyanga or any of the many sprawling townships that ring that city is hard." Ugandan To Aid Groups: Don't Tell Us What We Need — Ask Us! In addition, the posts that show off African development often featured the work of outside actors, according to Teddy Ruge of Uganda who is the CEO of Raintree Farms, an entrepreneur and a development critic not known for pulling his punches. "Show me a road that your country with your taxes paid for and was built by your people," Ruge says. "Yeah, it's certainly there in some places, but that's not the norm for the continent. The norm for the continent is 'Let's have somebody else fix our issues.' "
Ruge goes so far as to say that after decades of inaction and dependence on aid, Africans shouldn't be surprised by the negative perceptions. "If we fixed our own problems, we wouldn't be called a shithole." Trump's alleged comments were an easy opportunity to rant on a soapbox, he says, but wouldn't that energy be better spent "ganging up" on their own leaders to demand better governance, policy and implementation? Still, Ruge and Msimang agree that the Trump administration is ignoring clear data if it thinks people who immigrate to the U.S. from poor countries take more than they give. They also believe that solutions will only be reached by sustaining thoughtful, constructive conversation on the underlying causes of poverty, vulnerability and migration. "To characterize any place in hyperbolic, negative ways is unhelpful always," says Abby Maxman, president of Oxfam America.